A large deciduous tree with golden leaves. 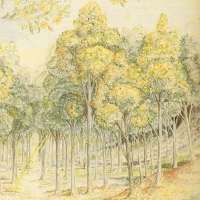 Most closely associated with Lothlórien, the trees also grew on Tol Eressëa, on Númenor, and perhaps also in Gondolin. 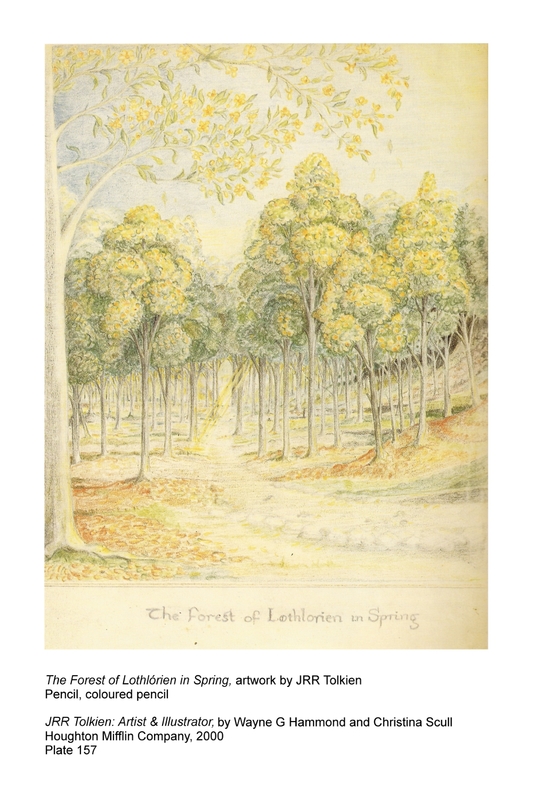 The Forest of Lothlorien in Spring, by JRR Tolkien. Not far from the falls of Nimrodel they found a cluster of trees, some of which overhung the stream. Their great grey trunks were of mighty girth, but their height could not be guessed. [? Rising] ground inside the circle was [?? thick with] mallorn-trees, the tallest they had yet seen in that land. The highest must have been nearly 200 feet high, 1 and of great girth. They had no branches lower than 3 fathoms 2 above their roots. Spring surpassed his wildest hopes.... In the Party Field a beautiful young sapling leaped up: it had silver bark and long leaves and burst into golden flowers in April. It was indeed a mallorn, and it was the wonder of the neighbourhood. In after years, as it grew in grace and beauty, it was known far and wide and people would come long journeys to see it: the only mallorn west of the Mountains and east of the Sea, and one of the finest in the world. The branches of the mallorn-tree grew out nearly straight from the trunk, and then swept upward; but near the top the main stem divided into a crown of many boughs, and among these they found that there had been built a wooden platform, or flet as such things were called in those days: the Elves called it a talan. It was reached by a round hole in the centre through which the ladder passed. [The talan was] made of grey close-grained wood — the wood of the mallorn. orn 'tree' in Celeborn, Hírilorn; cf. Fangorn 'Treebeard' and mallorn, plural mellyrn, the trees of Lothlórien. 1 In contrast, the tallest known tree in the world as of 2006, a coast redwood tree (Sequoia sempervirons), is nearly twice as high: 379 feet. "Calif. redwood may be world's tallest live thing." Msnbc.com News Services. 7 Sep. 2006. Accessed 6 Oct. 2011. "Redwood confirmed as world's tallest tree." Msnbc.com News Services. 1 Oct. 2006. Accessed 6 Oct. 2011. 2 fathom a unit of length equal to six feet (1.829 metres), used to measure depths of water. "fathom." Collins English Dictionary — Complete & Unabridged 10th Edition. HarperCollins Publishers. 6 Oct. 2011.